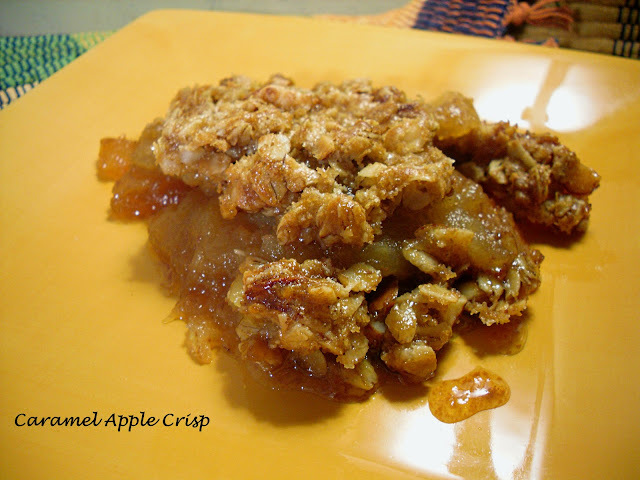 Caramel Apple Crisp- Improv Cooking Challenge! I've just joined Lady Behind the Curtain for The Improv Cooking Challenge! This week's challenge is Apples and Caramel. I couldn't wait for this to cool off! Apples swimming in a caramel sauce, topped with a buttery, crunchy crisp. To make the topping, combine the oats, flour, sugars, nuts and salt. Stil until blended. Pour the melted butter over and mix with a fork. Chill until ready to use. To make the filling, whisk together the sugar, corn syrup and 1/4 cup water. Cook over medium high heat, without stirring, until the sugar turns amber. Watch closely as this happens quickly. Remove from the heat and slowly whisk in the cream. This will bubble up very quickly. Return to the heat and add the sliced apples. Cook until the apples have softened slightly, about 10 minutes. Add the cornstarch mixture and bring to a boil and mixture thickens. Pour into a square baking dish - approx. 8 x 8 or a little larger and crumble the topping over the fruit. Bake at 400 degrees F for 25 to 30 minutes, or until golden and bubbly. Yes, Yes, Yes, where is the Blue Bell? That looks fabulous! Thank you so much for sharing with Full Plate Thursday. Hope you are having a great week and come back soon! Your crisp looks and sounds amazing! 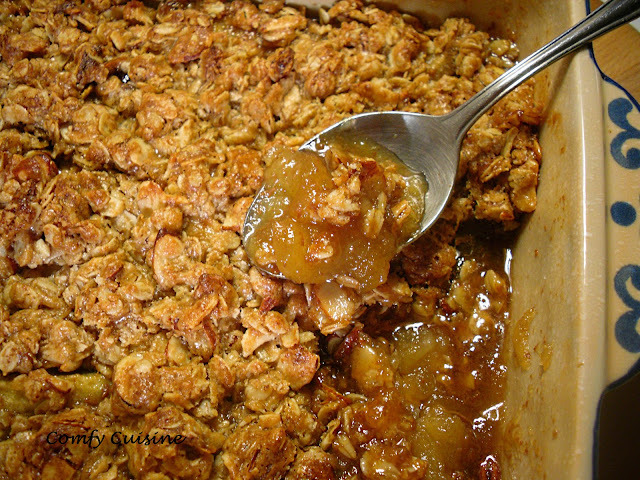 I have been craving apple crisp all month but I haven't gotten around to making it. What a great idea for this month's challenge! This looks like the perfect comfort food on a chilly day!